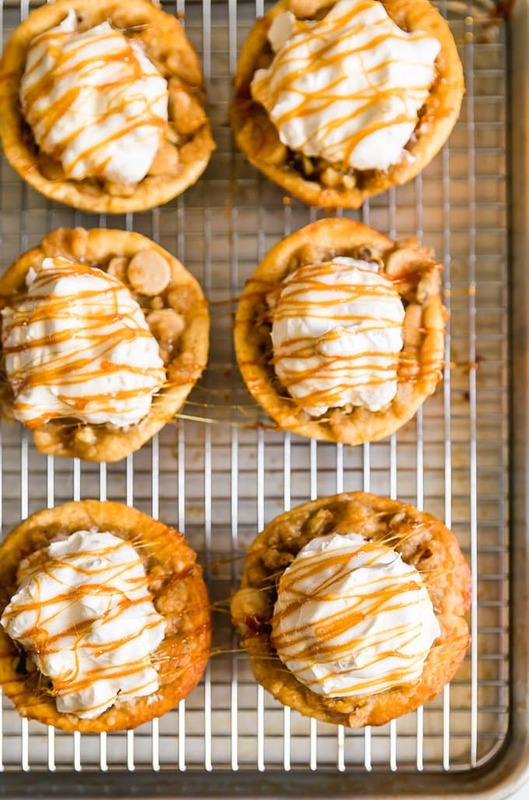 Apple Pie Cupcakes were originally posted in January 2014. 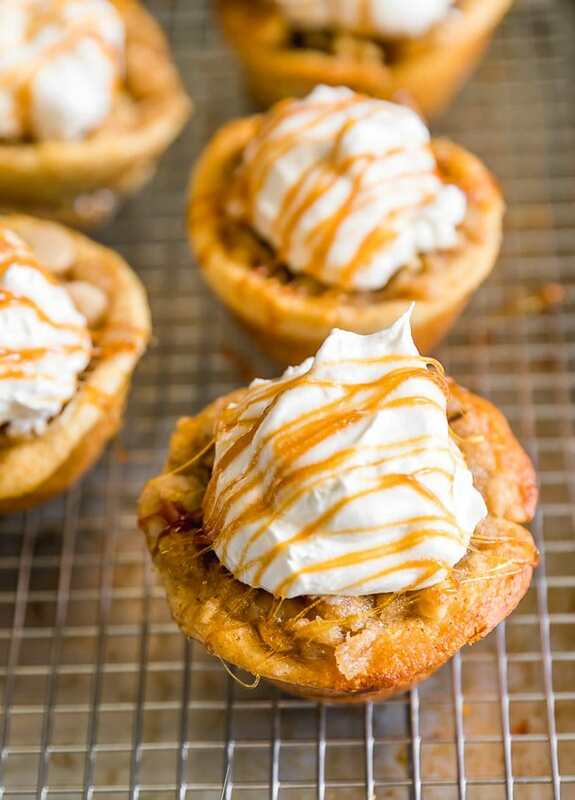 Apple Pie Cupcakes are one of the most delicious, EASY recipes on The Cookie Rookie. Apple Pie filling is stuffed into a pre-made cinnamon roll base to create the ultimate EASY Caramel Apple Cupcakes. This Cinnamon Roll Apple Pie Cupcakes Recipe has been a winner at our house, especially for Summer and Fall! This Apple Pie Cupcakes Recipe is the easiest cupcake recipe I’ve found. 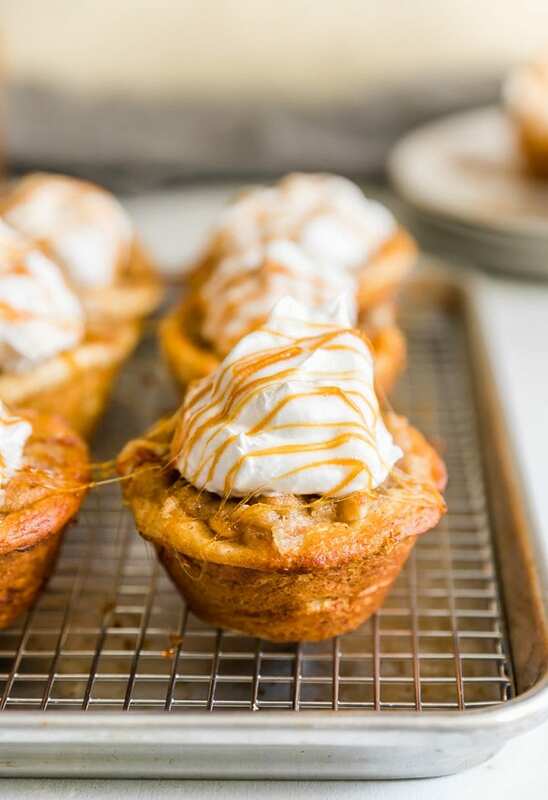 You can use pre-made cinnamon roll crust for these tasty Cinnamon Roll Apple Pie Cupcakes! Apple Pie Cupcakes were one of the first recipes I posted on The Cookie Rookie, back in January 2014! I was still so nervous to bake anything from scratch, so these Caramel Apple Cupcakes made with pre-made cinnamon rolls seemed like the perfect way to dip my toe in the pool of dessert making. 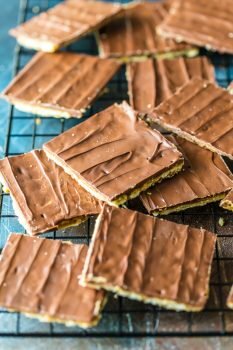 These turned out SO DELICIOUS, fun, and EASY that I’ve made them time and again over the years. Cinnamon Roll Apple Pie Cupcakes are a recipe I come back to over and over because they’re loved by all, perfect for holidays such as the 4th of July or even Christmas, and utterly fool-proof. You’ll be the star of the show, and no one has to know how easy these were. Apple Pie Cupcakes for the win! 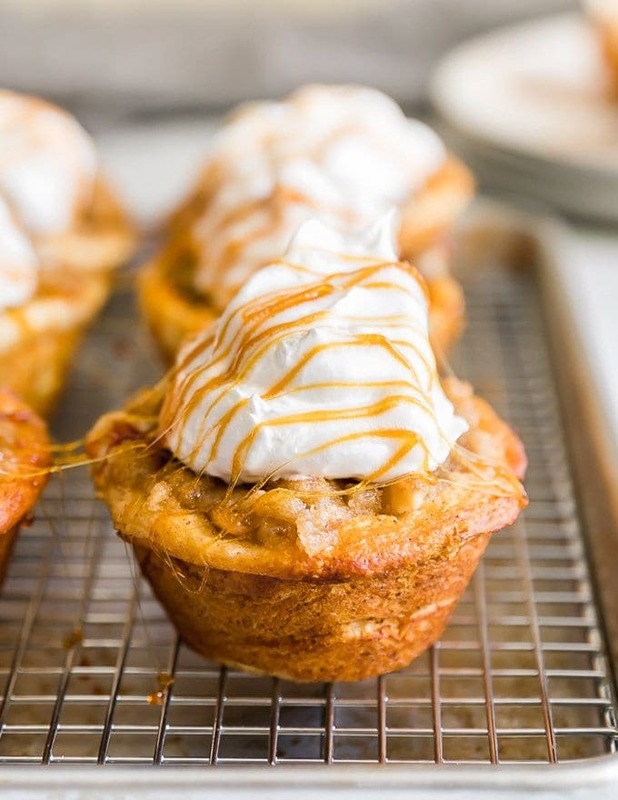 Bake these easy yet tasty Cinnamon Roll Apple Pie Cupcakes for a sweet and cinnamon-y treat! Cinnamon Roll Apple Pie Cupcakes are made in under 20 minutes with no “from scratch” baking required! 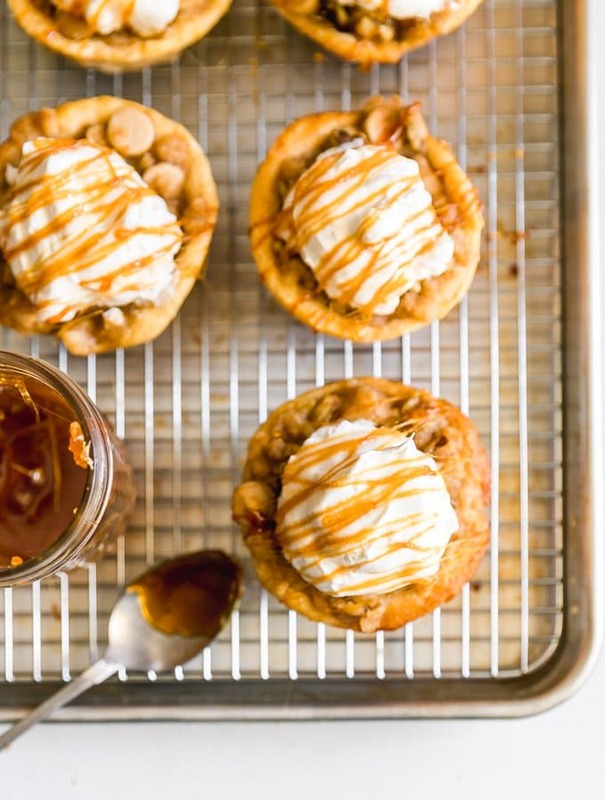 Apple Pie Cupcakes are my kind of dessert. I always liked that Food Network Show “Semi-Homemade” and felt like it spoke to me! I have no desire to make everything from scratch…it’s just not me. That’s more my Mom. 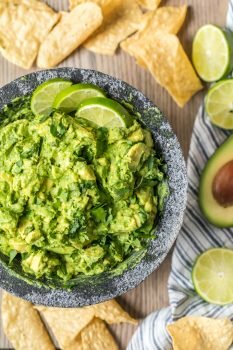 Her recipes are AMAZING, but I look for the hacks to make things easier. These Caramel Apple Cupcakes are one of my favorite Easy Dessert Recipes! 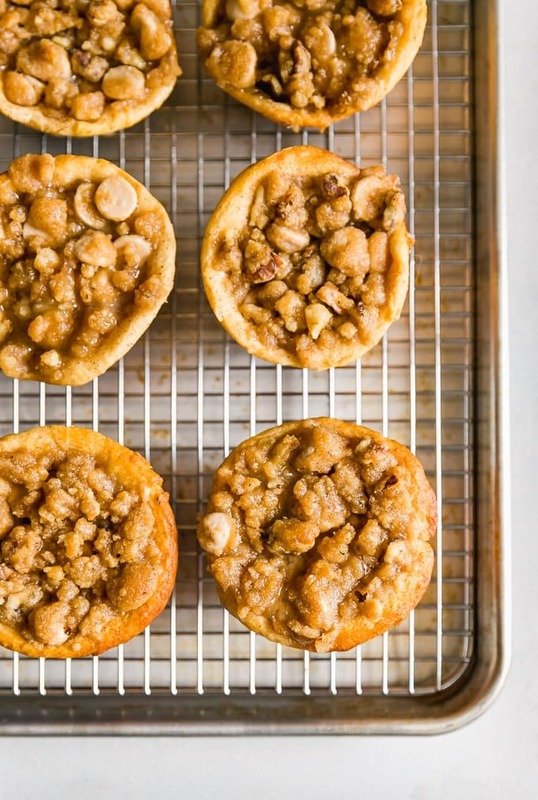 The best part about this Cinnamon Roll Apple Pie Cupcakes recipe is how simple it is. Like I said before, I’m all about baking hacks here, so we used a few pre-made ingredients to speed up the process. Plus a few other optional ingredients for toppings and decoration. 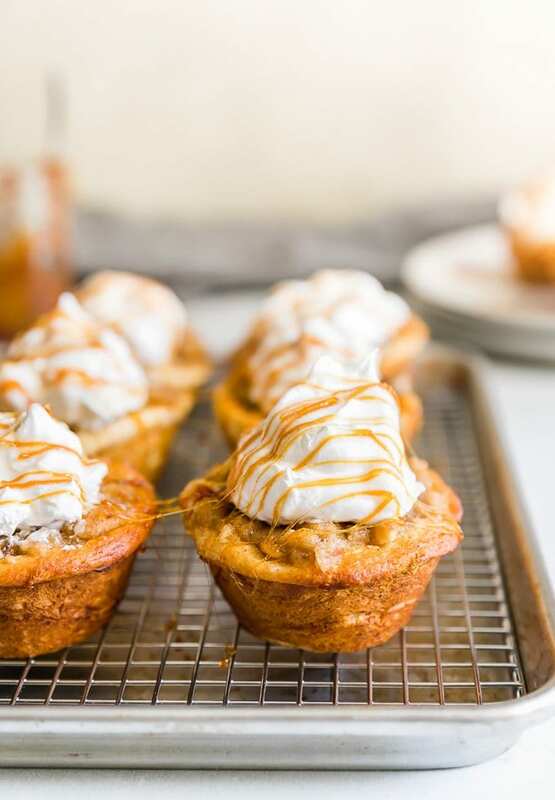 But the whipped cream and caramel syrup really bring these Caramel Apple Cupcakes to another level! Before removing the pre-made apple pie filling from the jar or can, take a knife and carefully slice through the apples to create smaller bites. This will make it easier to fill the cinnamon roll cupcake base. The walnuts and cinnamon baking chips are optional but I love the added flavor they bring to this recipe. I definitely recommend using both. If you can’t find cinnamon chips, butterscotch chips also work great! Be sure to flatten each pre-made cinnamon roll as much as possible (without breaking) before placing into the cupcake tin. You don’t want to base to be too thick to add that creamy filling! 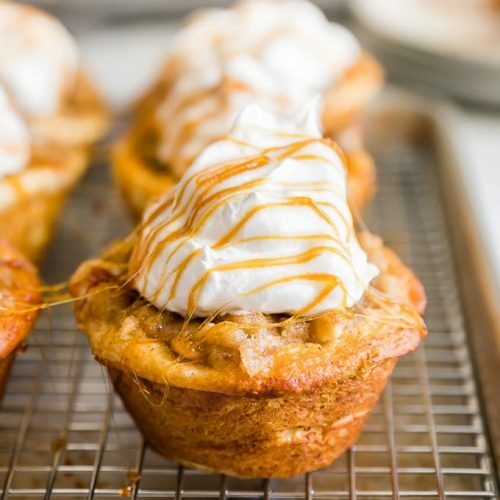 You are going to LOVE the taste of these Cinnamon Roll Apple Pie Cupcakes…and you’re going to love how easy they are to make even more! Watch the video or see the recipe card below for full details on How to Make Apple Pie Cupcakes. Enjoy! preheat oven to 400F. lightly spray muffin or cupcake tin. bake for 10-15 minutes or until the cinnamon rolls are fully cooked. These cupcakes look AMAZING. I can’t wait to try your recipe! They look delicious! My husband’s favorite is fruit pie. I am thinking of adding just a touch of walnuts and then top with whipped topping! Yummmm. that sounds really tasty! i’ll have to try them like that next time! Made these today for my husband! They were a hit! I used my half a dozen cupcake pan. This left two rolls, which I unrolled, flattened out and cut for lattice work. He says it didn’t even need topping. that makes me SO happy!!! thanks so much for letting me know :). i love the lattice work touch!! I am making “cupcakes” in mini flower pots for my daughter’s birthday… But now I am soooo torn! Her FAVORITE dessert is apple pie. She would love these. Do you think I could bake these in the pots?? Oh what a cute idea! I’ve never baked in pots but if it works for cupcakes it definitely might work for these! I would maybe test one and see? Happy birthday to your daughter! I made these from another recipe I found … They are awesome.. I chose to crumble cinnamon toast crunch cereal as the topping.. I made the cinnamon rolls cupcakes from another recipe I found … They are awesome.. I chose to crumble cinnamon toast crunch cereal as the topping..take the muffin pan out a little early..